The Montreal International Game Summit (MIGS) is one of North America's largest industry conferences for gaming. The yearly event attracts industry professionals, media, students and gamers from all over the world for two intense days of informative and insightful sharing of industry knowledge and experiences. NextGen Player has been covering MIGS for the past two years and we can honestly say that the conference is fantastic and never disappoints. 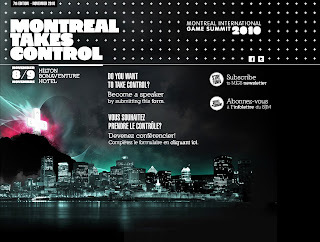 The 2010 event will mark MIGS' 7th and will be held on November 8th and 9th in Montreal, Quebec at the Hilton Bonaventure Hotel in downtown Montreal. MIGS has now officially made the call out for speakers for this year's conference. The Advisory Board is looking for industry professionals interested in speaking within one of the following areas of expertise: Visual Arts, Business, Design, Production and Technology. Presentation slots are 1-hour total, including any audience Q&A. To provide quality content that meets the expectations of organizers and delegates, the MIGS Advisory Board will review all submissions. So if you fit any of the above criteria, then this is a great opportunity to speak and share your insights at MIGS. To submit your application go to www.migs.ca. Applications must be submitted no later than March 31st, 2010.